Ten things you (probably) didn’t know about getting clean! It’s something that most of us take for granted. ‘Aving a wash, getting a scrub, jumping in the bath! Some of us do it every other day, most of us scrub up daily, and the super-fastidious among us do it even more often! Some forget to scrub behind their ears and others don’t dry between their toes or in their belly-buttons properly! What you think you don’t know about getting clean can be written on the back of a stamp, right? Wrong. Here’s ten things that I bet you didn’t know about bathing, washing, and general cleanliness! 1. Back in 2009 the world’s oldest woman passed away after slipping in her bath. She was 130 and had just had the new bathroom installed to celebrate her old age! Where’s Alanis Morisette when you need her? 2. The romans didn’t use soap, instead they rubbed olive oil onto their skin before scraping it off (along with any dirt) using a special scraper. Sort of like a slave-operated windscreen wiper. 3. 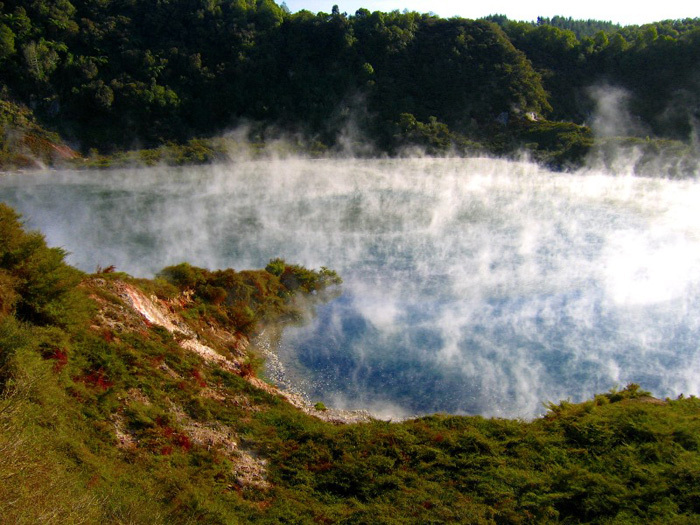 Frying Pan Lake in New Zealand is the largest hot spring in the world, covering an area of 38000 square metres with an average depth of 6 metres. The hottest areas of the lake reach boiling point! 4. Think baths are less water-efficient than showers? Not nowadays! 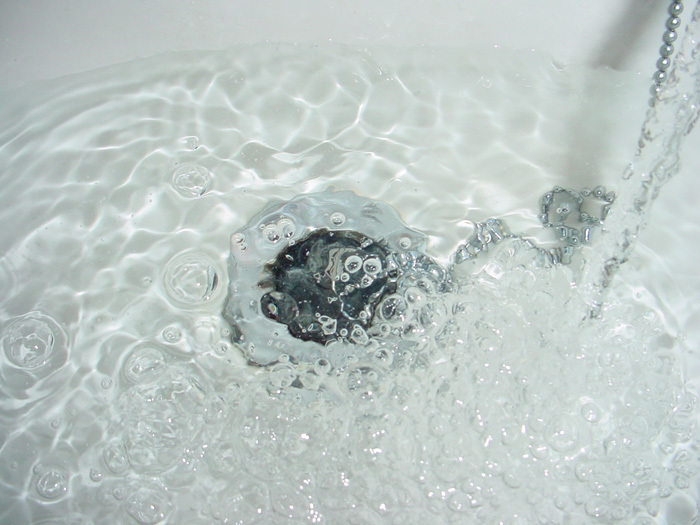 An average bath uses 80 litres of water whilst an eight-minute power shower uses around 136 litres. If you’re really serious about saving water, you could always share! 5. In medieval Europe, the Church thought of bathing as an “excessive” indulgence and believed that such acts led to immorality, disease, and promiscuity! In fact, so widespread were the fears of bathing contributing to ill-health that the daily bath (or shower) has only become a common occurrence during the past half century. I’ll bet Sunday mass used to stink! 6. The average temperature of bath water in the UK is between 38c to 40c – that’s just a couple of degrees above the average body temperature. 7. Every citizen of Kentucky, U.S.A is required by law to take a bath at least once a year. Personally, I think we should introduce this globally. Especially in London, in the Summer. All tube stations should install stink-o-sensors as standard. 8. A lady called Charlotte Lee holds the Guinness World Record for the World’s Largest Rubber Duck collection at 1439 different ducks! 9. The Japanese take the business of cleanliness and bathing very seriously. They even have an amusement park dedicated to the ritual with over 25 water attractions! 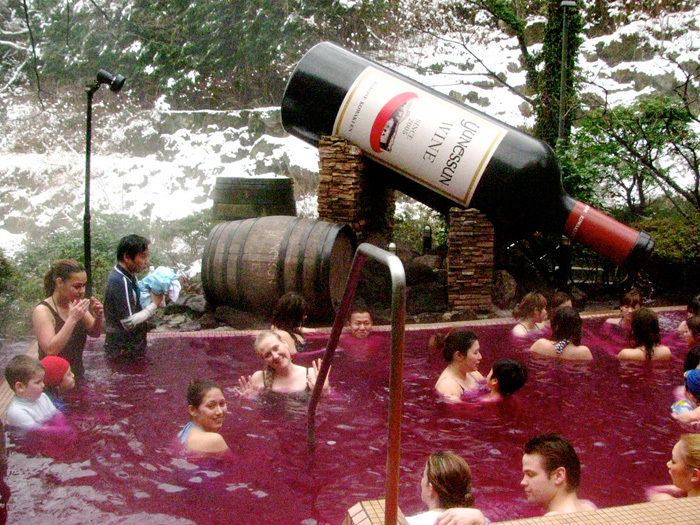 Visitors can choose between bathing in coffee, red wine, green tea, or even Sake! I wonder what the penalties are for drinking the water? 10. In the UK, it is the law upon entering a bath to immediately submerge your head and enter the land of Mermaidia. Particularly if you have long hair, in fact… if your hair is short, you should grow it immediately to let this occur. Ok, I made that last one up… but damn… you used to do this as a kid ALL the time right? Zirh Warrior Collection (£14.99). When I discovered these were being discontinued, I snapped up a few bottles to keep me going. Although aimed at men, I love the concentrated scent and divine lather. There’s something rather brilliant about having a “collection” of commonly-used toiletries like this and Zirh capitalised on using great ancient leaders to appeal to our sense of smell and personality traits. Obviously, I’m Caesar. OBVIOUSLY. Abahna White Grapefruit & May Chang (£17)*. Abahna are all about the ritual of bathing, about turning an ordinary experience into an extra-ordinary occasion. They’re definitely heading in the right direction with this beautifully citrusy number that perfectly marries the uplifting aromas of grapefruit with the energising zest of may chang. Bodhi Rosemary Chi (£23)*. When your spirits are in need of a little reviving, Bodhi’s synergy of Rosemary, Geranium, Petitgrain and Cedarwood oils is just the ticket. This bath and shower therapy is generously fragranced ensuring that both your mind and your senses are stimulated by the rich perfume. For an added boost, combine your bathing ritual with their new Rosemary Chi Himalayan Detox Salt Scrub by using your hot bath waters to dissolve the salt scrub after application. Genius. Kings & Queens Aztec King Vanilla & Pear (£3.33). No Tesco shop is complete without adding to my Kings & Queens stockpile, I’m currently due another haul as I’m on my last bottle. The sister brand of Korres have been inspired by ancient rulers from around the world to create a line of body products that delight both visually and during use. My personal favourite is a toss-up between Tsar Peter Tobacco and Caspar Myrrh. 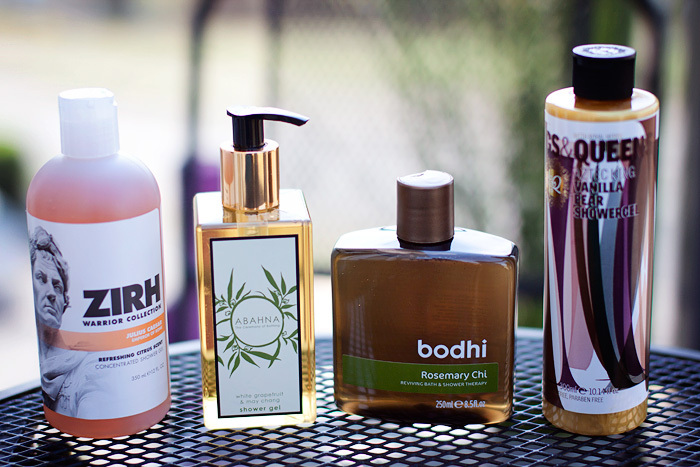 What do you to make your bathing routine that little bit less ordinary? NARS Holiday 2010 Main Collection – Sneak Peek!